Pro makeup artists know that the tools we use play a huge role in obtaining flawless picture perfect skin. High quality makeup won’t stand a chance if you’re not using quality brushes during your application. This is why Adesign continues to be the brush line Pro makeup artists recommend and constantly rave about. Adesign boasts innovative and trendy creations that keep you coming back for more. It’s the brand I reach for most in my kit that provides me flawless application with every stroke. Adesign’s craftmanship of their products is superb. Their super soft fibers are gentle against the face and hold the perfect amount of makeup. The sleek black handles are sturdy, and feel comfortable in your hand; even after working long hours. Not only are you getting high grade natural and synthetic hairs, but novice artists won’t have to worry about breaking the bank when starting out. Adesign makes their brushes accessible for all by being affordable and offering brush sets to suit your needs. Their skincare brush set serves a dual purpose. Not only can it be used to apply your favorite cosmetics, but also your favorite creams, moisturizers and facial cleansers. You can’t beat that! 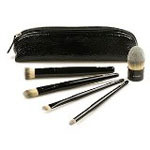 Adesign lists an essentials set, which generously offers eight popular brushes along with a sleek black case to hold them. Some of my Adesign favorites: The fluffy all over shadow brush; it provides a soft application of your base color and adds just the right amount of shadow. I absolutely love the cheek brush. Color is applied with seamless perfection to the apples of the cheeks, and I don’t hesitate to reach for it when highlighting. I have a few gel liners in my kit, but I tend to use the one by Adesign first. It’s top grade synthetic fiber is firm and holds its shape. The pointed foundation kabuki is indeed my favorite. At $26 this brush is a steal, and you can’t beat the way this large densely packed brush blends your cream or liquid foundation evenly across the face in a few short strokes. My clients have commented on the unique design and the softness of the fibers. When I’m pressed for time, this is what I go to because it allows for quick application and the finish is flawless. I use my pointed foundation brush to blend cream or liquid foundation around the eyes, nose and corners of the mouth. I can’t tell you how much I love the look of this brush. The eye 1 allows you to blend effortlessly in the crease and is perfect for clients who have smaller lids. And finally, you can’t go wrong with the flat top foundation kabuki brush. It is perfect for buffing in mineral, pressed and or loose powder and if you’ve been a little heavy handed with your foundation, this inexpensive beauty easily removes the excess.